When it comes to skin pampering, why men are left behind? Well, as seen women hold the benchmarks in being utterly beauty and skin conscious and men, on the other hand, does not get too much concerned on this front. But yes, the similar ways, they too have skin concerns like women do. Taking the cues from the rising skin issues among men and their needs over having a resort over their skin problems, L'Oreal has introduced a complete beauty range for men. Because c’mon men and women have different skin completely. We at TJC believes that men should be equally conscious about how they look and presents this extensive beauty range for them from the most trusted brand Loreal. L'Oreal men expert range fits rightly in taming all the skin issues they may face. It’s time to revolutionise your skin and hair with specially tailored formulas for maximum benefits. The products are designed suiting men’s skin and no matter what lifestyle or age you have, the products works wonder. In today’s day and age where stress is on a rise and skin being the biggest part of the body suffers haywire with the burgeoning evils. Men on that note usually didn’t bother much about the way they look or skin issues for that matter. But now no wonder, they are on a move to achieve the best skin with a glow, shine and smoothness that made them look equally confident and handsome. On that note, a healthy looking skin also is the result of what is soaring inside your body but the maximum one can do is keep the outer skin clean and clear. A total skincare regime with a cleanser and L'Oreal men’s moisturiser apt for one’s skin is just the right note of nourishment skin requires. 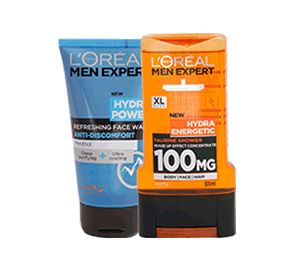 Not only this, with skin losing its energy over time, L'Oreal men expert hydra energetic products prove to serve the purpose. The products are vast that benefits the skin and result could be seen from the very first usage. L'Oreal shower gel too is the ideal and essential bath product especially designed for men’s senses and treating the body the right way. L'Oreal shaving gel assists in leaving skin more supple and lead a smooth shaving experience. So, why be losing? Achieve the skin of your dreams and brace your skin.